The Family Fund is a registered charity that gives grants to families with severely disabled children. It also helps severely disabled young people aged 16 and 17. The general aim of the Family Fund is to give such families, children and young people greater choice. This in turn provides more chances to get the most from life. The Family Fund helps 53,000 families all over the UK. The total amount of grants the charity awards each year is £31 million. Family Fund grants cover items that lead to an easier and more enjoyable life for disabled children, their families and young people. These items may be holidays, computers, washing machines or driving lessons. The figures given above apply to the total income of the household. This income includes money from work, benefits and tax credits. It also includes occupational pensions, maintenance payments, interest from savings and income from rented property. The Family Fund uses net and not gross earnings. In other words, it considers income from work after deductions for tax and national insurance. The Family Fund disregards child benefit, attendance allowance and disability living allowance. And there is no savings limit. The severely disabled child or young person must live at home. The Family Fund does not help if children or young people stay with relatives; live with foster carers; or are in local authority care. Furthermore, if a statutory agency has a duty to pay for a requested item, the Family Fund will not award a grant. 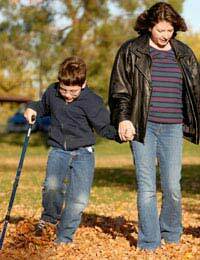 The Family Fund definition of severe disability is not necessarily the same as that of other bodies. Anyone who requests a grant has a chance to give the details of the disability on the application form. The Family Fund will then see if these details meet its criteria. No one has an automatic entitlement to a grant from the Family Fund. Every grant is discretionary. It also depends on the availability of funding. Most of the Family Fund’s money comes from the national governments of Wales, Scotland, Northern Ireland and England. The governments provide the money because they are committed to the needs of disabled children and young people. Applicants can ask for a grant once every 12 months. If an emergency arises and an applicant needs to ask for a further grant within a year of a previous award, the Family Fund may be able to help. The carer or parent of a severely disabled child or young person can request a grant. Applications refer to the whole family. If a request for a grant is for more than one disabled child, an applicant must supply details of all the children or young people on the one form. How do I apply for a grant for my daughter to get her a laptop? She suffers anxiety and is unable to go to school so Is home tutored. A laptop with help massively. Hi I am a carer for a disabled child with mental health problems how do I apply for a grant or find the application to apply?